Council Adminstrator: I slept better than for quite a while. Teacher: got home feeling really energised! College Adminstrator: I truly did enjoy it and it has helped me. Native American Practitioners: Thank you for a very enjoyable event. "Fantastic day today with you all, sooo great to learn and share together :)"
"I've found myself on a wonderful journey and the perks are i get to meet some great people. It was a fab day! Nice to have met you Keith. Thanks for a great workshop Mike!" "Great day yesterday , thanks to all who made it such a fun day !!!" "I was in such a good space.. too excited to be tired. The energy levels were amazing. I met some wonderful people. Thank you for a wonderful day - it was absolutely fantastic to connect to Mother Earth. Very primal I thought but so natural. You're very talented and gifted to able to share and teach us novices so easily. I did think that I might have felt a little self conscious, but not at all. A really fabulous day and I am looking forward to other drumming workshops. I've been humming / singing the Rise! Arise! Arise! It is such a blessing!" "Just wanted to thank you for a lovely day yesterday - I slept better last night than I have done for quite a while. It was lovely to meet some great people and to have the opportunity to bang my drum!!!" "Thank you for a really great day - enjoyed the course so much and got home feeling really energised!" Had to laugh at loud at your Power/Force feedback, it was a bit of a cacophony there for a while & I was deafening myself right from the start ...but I swear it was the drum, lol! Reminds me of the Waterboys song, 'But if I know you, you'll bang the drum like monkeys do!' I'd spent the past week thinking I need to get my ears Hopi candled to allow a bit more clairaudience to come through, but after the shamanic buzzing in my ears all day I think I just got that! Loved the Pow Wow, loved the journey, and loved loved loved the chants and dances for blessing at the end, really struck a chord... and yes loved the Arapaho ghost dance in the fields, very many chords struck in one day, lovely." "I truly did enjoy it and it has helped me. It explained a few things to me which is always good." "So much has occured since Saturday that it would be hard to tell it all. I do know I have to dance more!..the final Arapaho dance was amazing and something truly special to have been part of." "Thank you so much for these lovely photos and the extra information. The day was brilliant! I cannot stop singing the songs and chants and I am saying Ho! to make my days be even more productive too! I am so looking forward to Sawston [next Native American drum & dance day]. Keep up the great work and have a great week too. I have been keeping up with my chants and songs - they are awesome and stretch the heart out very wide." "Enjoyed entering into Native American shamanism, have spent most of my years immersed in Eastern Mysticism & British Isle spirituality (loved the Celtic stuff!) so this was something new and exciting for me.... and at the same time familiar, what with eagle totems and the four directions..."
"Thank you for facilitating and leading us in our merry dance, sorry if I wasn't quite all there, by the end I was completely wiped out (in a positive healing way) and could hardly use my voice anymore, kind of felt like receiving reiki where symptoms can often intensify before being healed... still processing some of the amazing experiences on this level, I feel, deepest gratitude to you for all of your energetic input, the healing ritual with the White Buffalo Woman was completely mind blowing for me!!! Loved your raccoon hat! I loved the rattle healing with the White Buffalo Goddess, found it immensely powerful (both invoking/rattling and receiving) and I was off in the Other World with 'All Our Relations' with the Peace Pipe. I found Lenice's flute playing completely transporting, I could have listened to her for hours, wasn't it amazing how the wind joined in with her instantly as soon as she started playing, shimmering in the blinds behind her." "Thanks for much for a wonderful day on Sunday, I really enjoyed myself. I found the singing particularly uplifting... I loved the songs, the words, the connection to others. I also really enjoyed the drumming outside in nature - thanks for taking us outside. 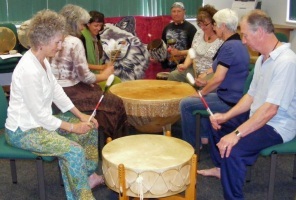 I feel inspired to do more drumming - will join Lenice in a drum making workshop so we can create our own. Again, many thanks - it was a lovely group and day." "What a good day. I enjoyed it very much, I slept for 11 hours that night!" "Just wanted to thank you for such a great day yesterday, I had a brill time, the day was so full of laughter, I especially got a lot from the White Buffalo Women Healing." "I've had a bit of a clearing since Sunday, all the dancing and singing, and I can't get that song 'Mother Earth' out of my head, it's like the Go Compare advert! :)"
"Thank you for a very enjoyable event. It was lovely to meet everyone again and do some drumming etc. We look forward to seeing you again for the Intermediate Course." "Thanks Mike for a really magical day - I really enjoyed myself!"